The Washington state ABLE savings account allows people with disabilities to save tax-free for living expenses without jeopardizing eligibility for federal aid programs. "This is a groundbreaking program," says the mother of one participant. When Emma Patterson was born 16 years ago, her parents were told by social workers that they should never set up a savings account in her name for college or any other future expenses. That’s because Emma was born with Down syndrome. If Emma had more than $2,000 in assets, she could lose disability and other federal benefits she was qualified for. Federal rules require that people who receive certain kinds of benefits be nearly destitute — they can have very little of their own savings. “This entire time, we have been very careful not to put anything in her name,” said Emma’s mom, Amy, of her daughter who’s now a student at Lake Stevens High. A new law has changed that equation. Called the ABLE Savings Plan, it allows parents and adults to set aside money in a special account for a broad range of living and educational expenses without jeopardizing disability funding, such as Medicaid, Supplemental Security and other federal benefits. The account’s growth is tax-free, and the money is invested in the account-holder’s choice of a blend of stocks and bonds. Starting in June, the plan will charge a $35 annual maintenance fee. State legislation required that ABLE had to be self-supporting, and the money goes to the state and the company that runs the program, Sumday, for administrative costs. Word of the ABLE plan has spread slowly in this state; so far, only about 257 people have enrolled, said Peter Tassoni, manager of the disabilities work group at the state Department of Commerce. The commerce department believes more than 130,000 people in Washington are eligible, and about 30,000 to 50,000 have the financial assets to make use of the accounts. “For 40 years, federal and state agencies have been telling people, ‘You can never save money,’ and now we’re flipping a switch and saying, ‘Hey, you can save money,’ and people are very skeptical about that,” he said. Participants can set aside $15,000 a year in an ABLE account, or more if they are employed. The money can be withdrawn immediately to pay for a wide range of expenses, including education, medical services, groceries, rent, transportation, employment training and support, assisted technologies and personal support services, and a few other categories. The money can also be saved for retirement. Anyone living in Washington state who became disabled or blind before the age of 26 is eligible; there are some restrictions regarding which types of disabilities are covered, and are spelled out on the ABLE savings plan website. The Pattersons are using the account to save for Emma’s college expenses. 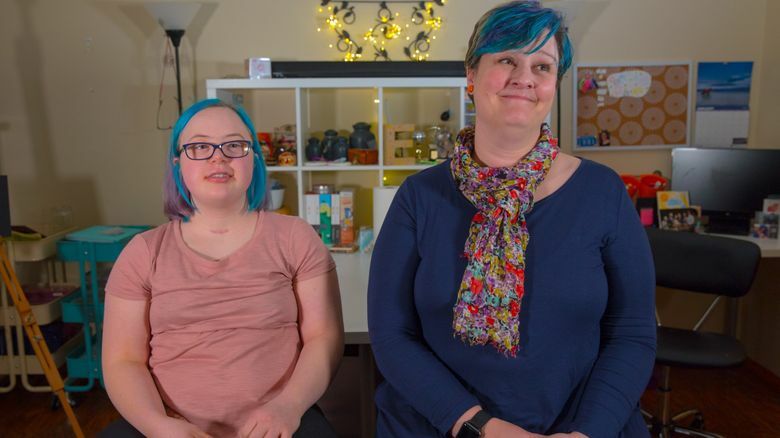 Last year, Emma testified before Washington state legislators in favor of the bill, and Amy Patterson took several trips to Washington, D.C., as well to lobby for the federal legislation that allowed the states to create ABLE accounts. After Emma was born, the Pattersons were told that her life choices would be limited. But over the years, the Pattersons have met other people with disabilities who are leading successful, fulfilling lives. “There really aren’t a lot of limits to what a person with developmental disability can do with their lives,” Amy said. 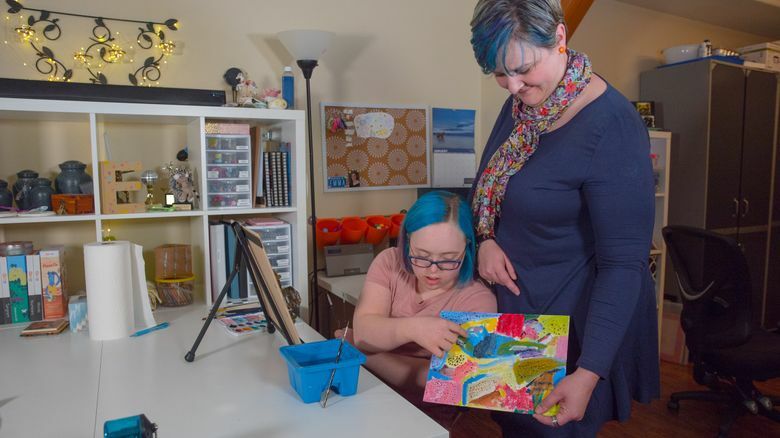 Emma wants to go to college, then work at a place like Seattle Children’s hospital, helping comfort children who are scared of medical procedures by teaching them to paint. “She has some big career goals,” Amy Patterson said. The money can also be saved by working adults who are disabled, and Tassoni said lawmakers hope people with disabilities will be more likely to seek employment as a result. Because they can stash the money away in protected ABLE accounts, earning a paycheck won’t jeopardize their benefits. “The idea is this is going to help push more folks to self-sufficiency,” he said. The program was made possible by a change in the IRS tax codes in 2014, allowing individual states to set up their own programs. Washington is partnering with the state of Oregon, and the program rolled out last year. In all, 40 states are participating. For more information, go to WashingtonStateAble.com, or call 844-600-2253.